Download the Triumph PDF Brochure. Engage the RevolutionAirTM threader, push a button and the Triumph needles are threaded! 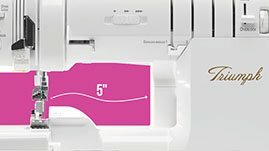 Baby Lock’s RevolutionAir Threading makes setting up your machine faster and easier than ever, every single time. 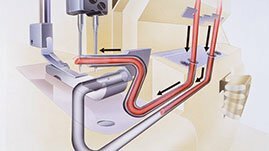 Insert thread into one of the Triumph’s threading ports, push the button and a gust of air quickly pushes it through the patented tubular loopers, exactly where you need it every time. Tangles, knots and breakage are now a thing of the past! Easily serge large projects with room to spare. 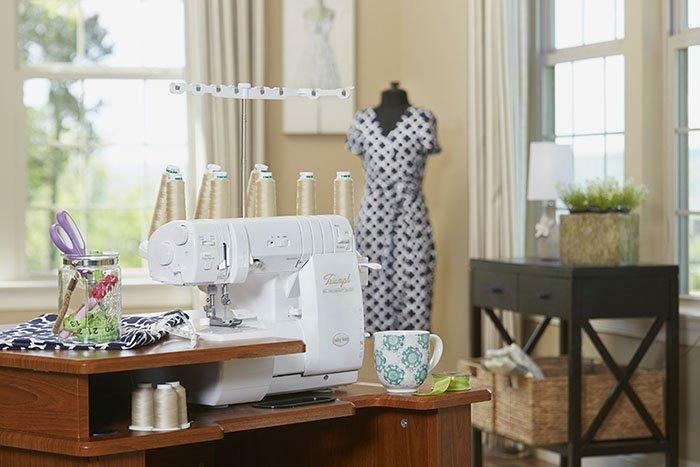 You’ll love adding decorative stitches to yards and yards of fabric. Never worry about tension adjustments again. 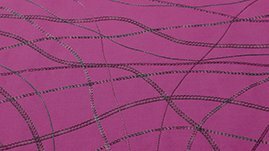 Enjoy perfectly balanced stitches regardless of the type of fabric you’re using. And ATD lets you thread your loopers in any order. Clearly see every stitch, fabric and thread color under six bright LED lights. Always stitch at a comfortable pace for the utmost precision. Raise the presser foot by simply moving the attachable lever with your knee. This leaves both of your hands free for extra control on detailed stitches. An easy-access presser foot lever in the front of the machine lets you quickly make adjustments. 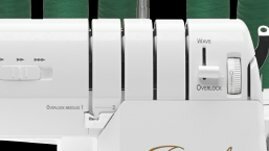 This exclusive Looper Drive System prevents loopers from becoming misaligned or out of time, reducing the possibility of major looper damage. This protects your machine from needing repairs, allowing you to serge worry free! 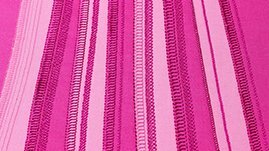 Imagine no exposed thread and no thread guides. Your thread remains protected and tangle-free. Baby Lock took the differential feed mechanism to a new level by adding a single unit feed dog mechanism. This ensures stronger feeding as well as more consistent gathering on all fabrics. 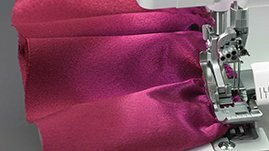 Baby Lock created a knife system with a larger cutting bite that allows thicker fabrics to be cut with ease and increased visibility. 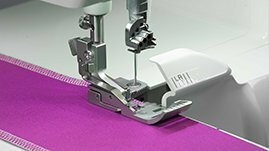 The Fabric Support System keeps stitches flat and balanced, no matter what speed, fabric or stitch you choose. The built-in stitch fingers actually move with the knife blade, adjusting the seam consecutively with the cutting width. 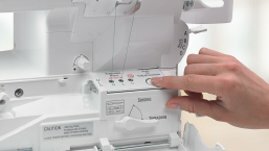 Stitch length can be easily adjusted on the Triumph using one dial. 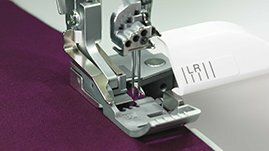 This dial includes an Automatic Rolled Hem setting that will retract the built-in stitch width finger for a rolled hem finish. 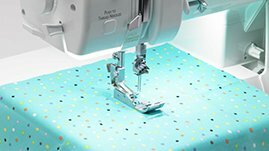 Baby Lock has revolutionized the cover stitch with the Triumph! 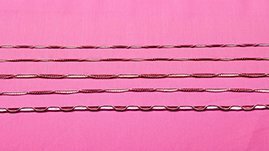 Functions include chain, cover, and triple cover stitches. 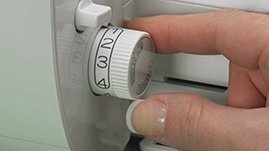 All three cover needles are controlled by one tension dial, so you can save time with one simple adjustment. 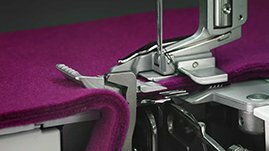 While most machines use slanted needles that push and damage fabric, Baby Lock’s needles are set vertically and sew directly up and down. 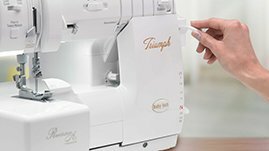 This exclusive feature protects your fabric and prevents needle deflection. 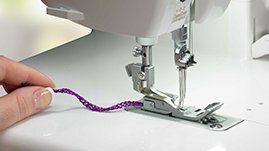 Baby Lock has made cover stitching easy to start or stop by automatically chaining off the cover stitch. 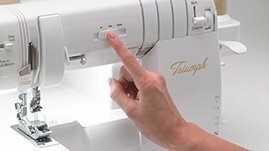 What’s more, the Triumph sews through heavier fabrics better than most cover stitch machines. With eight threads, the Triumph gives you 87 stitch combinations. 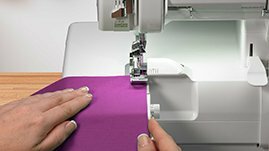 Plus, you can combine overlocking and cover stitching in the same operation. For a stitch as unique as the Wave Stitch, Baby Lock wanted to ensure that each wave would be even with the next. To do so, they created a thread delivery unit to give each one a flawless look.